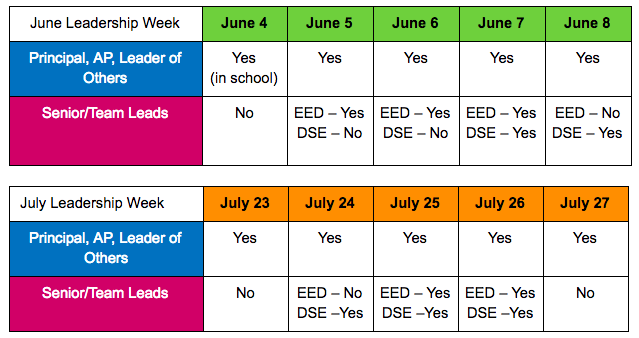 Please see the chart below for required dates for Summer Leadership Weeks for New-to-Role and Returning-to-Role Elementary (EED) and Secondary (DSE) Senior Team Leads and Team Leads. Details about content, location, and times will come from your IS as the weeks approach. Your IS may reach out with alternative expectations for your network. The only additional spring and summer teacher leader professional learning is for Teacher Leaders who will be brand new to their role next year (see section below). If you will be new to your TLC teacher leader role in 2018-19, spring and/or summer professional learning is required to deepen your understanding of the role and prepare you to start the year strong. Please review and register for pre-service professional learning training in the table below. Additional Information about the content in these trainings will be communicated soon. Register for Spring Onboarding: Register for the one-day onboarding session HERE. Register for Summer Training: Register for one of the two-day summer trainings for new Senior/Team Leads in SchoolNet by using the PD search code “stlplop1” for June 11-12 or “stlplop2” for August 2-3. Register for Initial LEAP Observer Training: Register for the two-day Initial LEAP Observer Training in SchoolNet by using the PD search code “ilotspring18” for spring dates and “ilottraining” for summer dates. If you are new to DPS, please contact the LEAP Team at LEAP@dpsk12.org for dates and registration. Training and online certification must be completed prior to August 10, 2018 to serve in role. Hold time on your calendar for Summer Leadership Weeks: You will attend summer leadership weeks with your school ILT during the weeks of June 5-8 and July 23-27 (see chart above). Register for Summer Training: Register for one of the one-day summer trainings for new Team Specialists in SchoolNet by using the PD search code “ntsplop1” for June 4 or “ntsplop2” for August 10. Register for Summer Training: Register for one of the one-day summer trainings for new Regional Team Specialists in SchoolNet by using the PD search code “ntsplop1” for June 4 or “ntsplop2” for August 10. Hold time on your calendar for Teal Day Planning on August 7. Register for Summer Training: Register for the one-day summer training for new New Teacher Ambassadors (NTA) using this link. Note: The August training is for New-to-Role NTAs that did not attend in June. Register for the New Teacher Ambassador Training Webinar: This 60 min webinar will begin at 9 am on July 26. Click here for registration information.